Well, all I came out of there with was a $9 swimming skirt and a black summer dress that was so much on clearance it was practically free. Seriously?! That’s it?! I literally still felt like I wasn’t ‘allowed’ to shop, so I couldn’t even look at anything. My brain had trained itself not to need or want or view anything at a store. It was the strangest feeling in the world that I was actually allowed (and being encouraged by my friend) to purchase whatever I wanted. I just couldn’t comprehend it. Now, before you think anything too grandiose about the effects of this experience, I’m quite certain I’ll get back to the swing of things and embrace shopping again – have no doubt. Each time I wake up in the morning and realize I need to replace those 15-year-old pillows, I am motivated to shop. Each time I get made fun of for wearing torn up shoes, I am motived to shop. But you know what isn’t there anymore and I hope never comes back? That feeling of being motivated to shop out of feeling like I don’t have enough. I hope I never have that feeling again. Well, I am embarrassed to say that I looked at my record this morning and I am now only at 36%. What happened? Did my pride and complacency cause me to lose my motivation to give generously? I’m not sure. But I do know that making it to the ‘finish line’ this past Saturday definitely doesn’t make me feel like I have “arrived” in my generosity. It makes me want to search and pray for what the next challenge in my life will be. There’s no other place I’d rather invest my time and money than in the local church. At Community, lives are being changed every day. It blows my mind. Just last weekend, 25 people gave their lives to Christ through baptism. It was incredible! The stories behind these 25 baptisms will absolutely change you when you hear them. I’ll try and post some of them up here in the next few days. For me, there isn’t a bigger motivator than seeing someone’s life changed. It causes me to reallocate my spending so that I can give generously when someone gets baptized. I want to invest in the place that fostered this life change and will continue to encourage this life change. So that begs the question, what now? 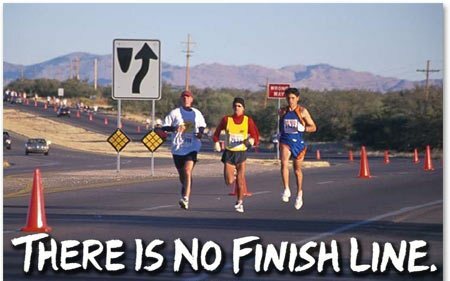 If you haven’t reached the actual finish line, then what is the next leg of the race going to look like? I’m not sure yet. I am praying about that right now, and I will definitely keep you posted. Any ideas? Thank you to everyone who encouraged me along the six months, gave me nice clothes to borrow for special events, made fun of me when I wore things from the 80s, and challenged me to take this to the next level. And thank you to Community for being a place that helps people find their way back to God so effectively that it would motivate and inspire someone to stop their spending so that they could give to that cause. I am humbled to be a part of the team, and I am looking forward to what God has in store next…. Yes! Its time to shop all the clearance racks and Back-to-School sales! My favorite shopping sprees are at re-sale shops and Goodwill. I bought like 50 books for 35 bucks, where I would be lucky to get 7 at B&N for that. And, I can give them away without guilt of “wasting” money. Hope you are sleeping on fluffy new pillows soon. Julie, Way beyond cool! Proud of you and thanks for the inspiration. I sensed 2 things from talking to you during the “fast”: a desire to follow God’s leading and following with a “glad heart!” May you never lose these qualities. When I grow up, I want to be like you!!! Any time we could go for lunch? I’ll BUY…you teach…DEAL? This should go on the CCC Generosity blog. Very nice job. Thanks for leading by example and pushing others. And take the lunch deal. I’m sure my wife can help you get back to the “shopping swing of things”. Wow, Julie, that’s HOT! Praise God for your generosity! I hope more of us can get on that train (including me!). Thanks for your passion and vision. God’s spirit radiates from you and inspires me when we’re together. I can’t say I’m up to your 40%, by any means, but your story reminds me of his life lessons. For example, paying more than $5 for a restaurant meal bothered him. To him it simply meant less to the Kingdom. I can’t wait to get started on my own shopping fast. Could you please post/send your Feb info on how you got started. Thanks! Sign: wdpad Hello!!! hmttr and 903wnsddzebzm and 361 : I will try to recommend this post to my friends and family, cuz its really helpful. I hope the Canucks go with a new 3rd in the near future. They don’t necessarily need a whole new wardrobe, but two blue jerseys are a little redundant. A green one would be a welcome addition, just as long as that cartoon Johnny Canuck stays away from the main logo (not a fan of it being a secondary as it is). If they go down the JC route, a logo along the lines of the Vancouver Giants would be an improvement over the current one. I do agree with all of the ideas youve presented in your post. Theyre very convincing and will definitely work. Still, the posts are too short for beginners. Could you please extend them a bit from next time? Thanks for the post. Very interesting points you have remarked, appreciate it for putting up. “Ignorance, the root and the stem of every evil.” by Plato. Would anyone who has been a piece in the program from the beginning mind sending me copies with the prior letters? I’m signed up now but unfortunately did not hear of this until now. Many, many many thanks in advance. I really like this website , and hope you will write more ,thanks Elsey UGG Boots pas cher a lot for your information. I must thnkx on your hard work you might have devote scripting this website. My business is wishing the exact same high-grade web site post in the human body into the getting close to at the same time. Actually ones very creative making ability has got stimulated everyone to buy mine, your own blog at this time. Actually the weblog is usually releasing its own wings quickly. Ones be able to write reduce is a wonderful a person because of this. This is a sensible blog. I mean it. youve got most data concerning this issue, and such a lot passion. you also skills to form people rally behind it, obviously from the responses. Youve got a design here thats not too flashy, but makes a press release as huge as what youre saying. Great job, indeed. I don’t discover how a great offer added with this the region can consider. Admiring the time and effort you put into your blog and detailed information you offer. It’s great to come across a blog every once in a while that isn’t the same old rehashed material. Fantastic read! I’ve bookmarked your site and I’m adding your RSS feeds to my Google account. certainly like your website however you need to take a look at the spelling on several of your posts. A number of them are rife with spelling problems and I in finding it very troublesome to inform the truth however I will surely come again again. The third option is the one that’s the most time intensive but also has its positive aspects. It’s like having a effective restaurant and buying another cafe and operating them simultaneously. Thanks for this specific web site. Sorry for the particular offtopic question, but might you recommend blogEngine previously mentioned WordPress? cause I am contemplating working with that. Pretty nice post. I simply stumbled upon your weblog and wished to mention that I’ve really loved surfing around your blog posts. After all I’ll be subscribing for your rss feed and I’m hoping you write once more very soon!